Poppet Valves - ACI Services, Inc. Single deck valves have only one layer of poppets, rings, or plates. They are used in compressors where it is necessary to keep the fixed clearance low. This is usually the case with high speed compressors, and some low speed compressors. Generally if the pressure ratio is over 2, it is highly likely that most of the valves will be single decks. These have less flow area than double deck valves or deck and a half valves which will result in taking more energy to push the gas through the valves. These valves have two layers of poppets, rings, channels, strips, or plates. These are usually used in low pressure ratio applications such as transmission of natural gas. These valves have more flow area than single deck valves and require considerably less energy to push the gas through the valves. These valves typically have slightly less fixed clearance than double deck valves. They typically have more flow area than single deck valves, which results in lower energy required to push the gas through the valve. If compressors are overloaded a lot of the time, changing from single deck valves to double deck valves may help to unload the compressor by adding to fixed clearance and by improving the efficiency of the compressor. 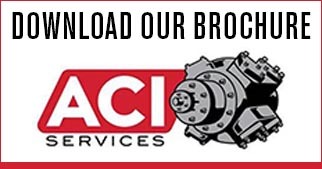 Radial valves made by ACI Services, Inc. have the most flow area of any available valve. Typically these have 2 to 2 1/2 times the flow area of single deck valves. These have poppets that are arranged to seat on a cylindrical surface. Radial suction valves have the poppets seat on the inside of a sleeve, and radial discharge valves have the poppets seat on the outside of a sleeve. The fixed clearance associated with radial valves is comparable to that in double deck valves. These extremely efficient valves manufactured by ACI Services, Inc. are justified in cases where the cylinders have limited valve area available and may result in reducing the energy required to push the gas through the valves by 50% or more.